India vs Australia 4th Test Sydney: It was a heartwarming gesture from India wicketkeeper Rishabh Pant to see him walk up to Hanuma Vihari who was standing at forward short leg take a solid blow when Marnus Labuschange swept the ball. 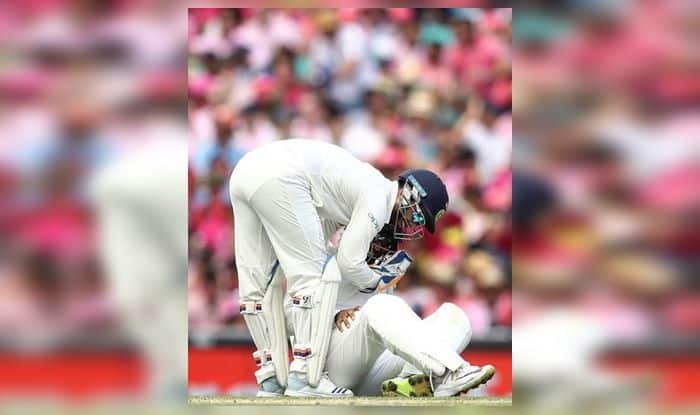 India vs Australia 4th Test Sydney: It was a heartwarming gesture from India wicketkeeper Rishabh Pant to see him walk up to Hanuma Vihari who was standing at forward short leg take a solid blow when Marnus Labuschange swept the ball. It hit him flush on the groin region, he was on the ground crying in pain. Pant went up to him to help him recover. The gesture is bound to win your heart. Pant had earlier hit a breathtaking century. He remained unbeaten on 159* which was also his career-best. He also became the first Indian wicketkeeper to slam a century on Australian soil. Earlier, it was hilarious to see how the gloveman got so excited, he kept on saying something or the other to the spinners Ravindra Jadeja and Kuldeep Yadav. On one occasion he asked Jadeja to get the ball more on the stumps and bowl fuller on another occasion, he was there is a wicket around the corner to all the close infielders. On some occasions, an animated Pant broke into laughter for no rhyme or reason. It was more about getting in the mind of the batsman and he has been off of the best in this series when it came to all the banter. Rishabh Pant’s chatter was hilarious and enjoyable at the same time for the commentators and the fans. The Indian fielding throughout the Sydney Test and the series been top class and hence as a fielding unit the temptation of creating doubts in the batsmen’s mind will always be there.